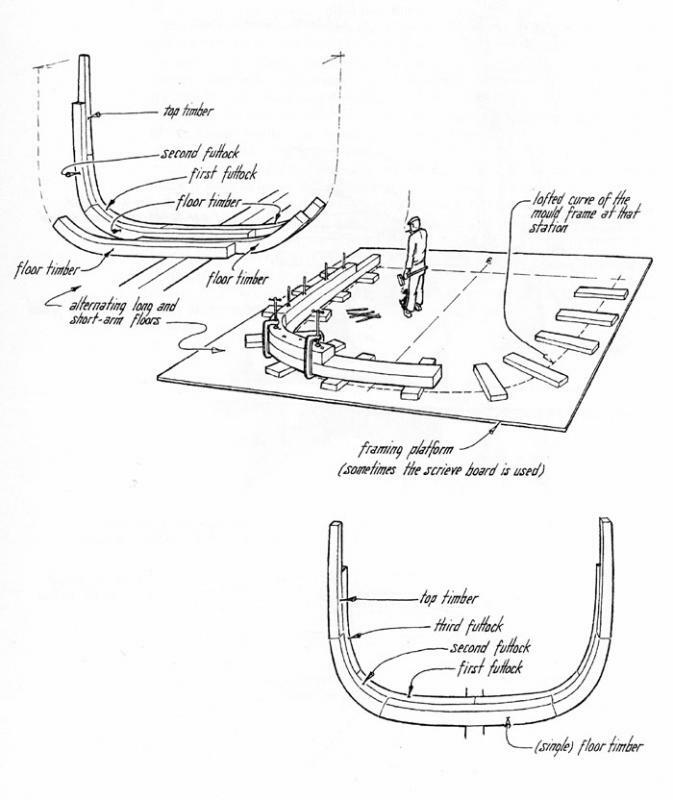 This diagram shows how the frames or ribs are built for a Maine schooner. Because one cannot find a big enough tree that has exactly the right shape for the entire length of the frame, it is built in many pieces, called timbers and futtocks. 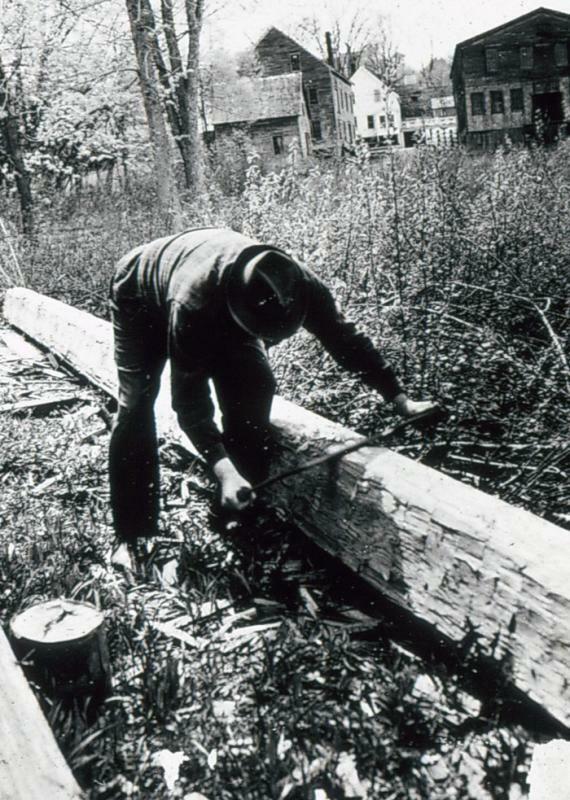 The frame is double thickness, so that there is overlapping wood at the end of each futtock. The frames are built on a platform, then raised on the keel. 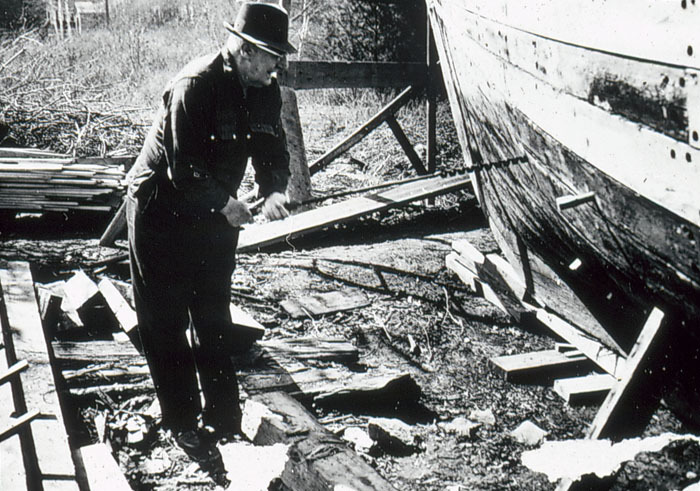 This image is from Basil Greenhill and Sam Manning, The Evolution of the Wooden Ship, 1988, p. 107. Used by permission of the artist, Sam Manning. 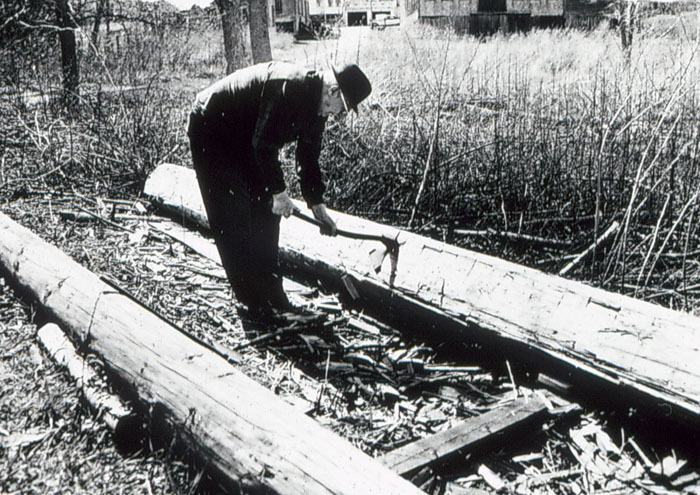 Using an adze to shape a timber, perhaps in this case, making a round tree square to turn it into a spar. After the hull structural members are in place for the deck, the planking may be layed. In this illustration, the planking is held in place with clamps while it is bolted into place. The deck planking is then caulked and the seams payed with tar, so that the deck is watertight. 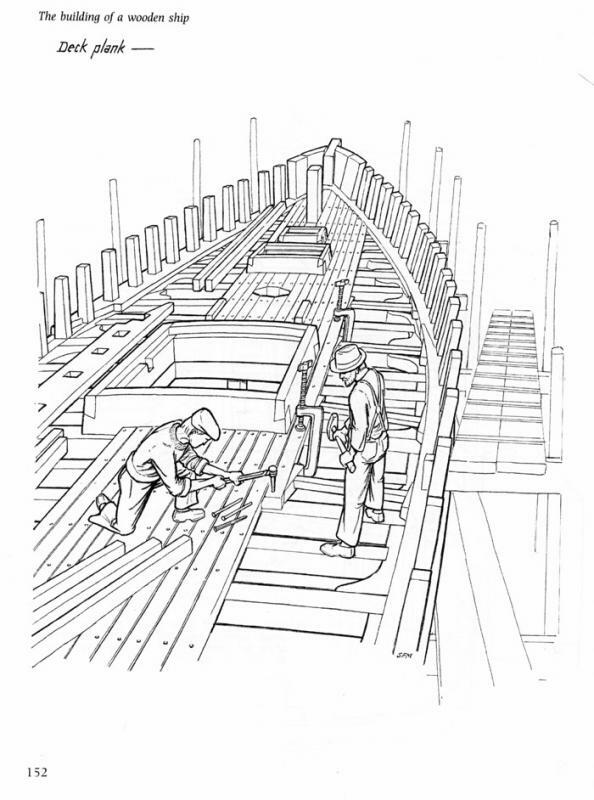 This image is from Basil Greenhill and Sam Manning, The Evolution of the Wooden Ship, 1988, p. 152. Used by permission of the artist, Sam Manning. 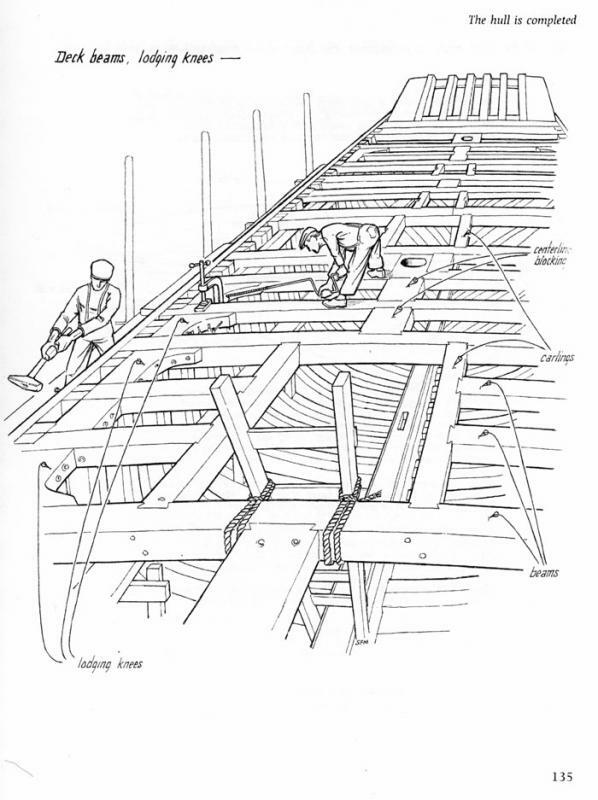 This diagram shows the construction of the deck, using deck beams across the hull, ehich sit on hanging knees. 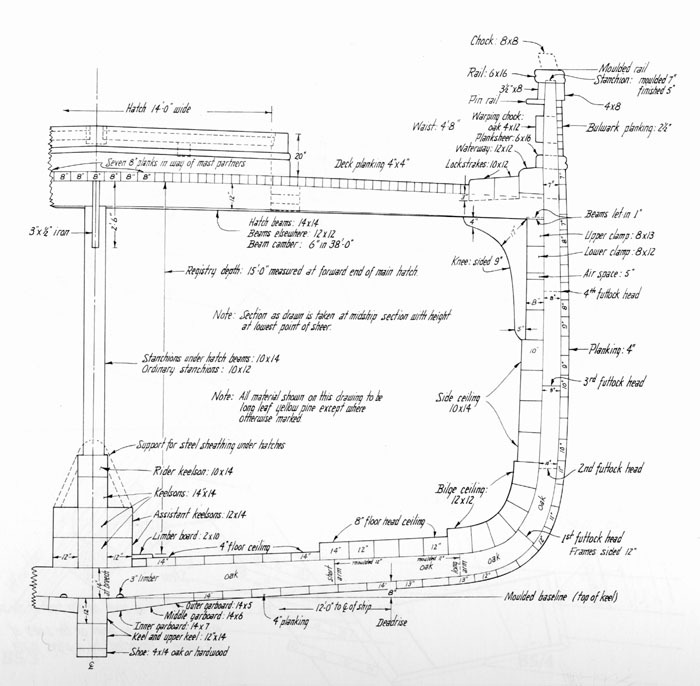 Between the deck beams, the shipbuilder uses lodging knees to give horizontal strength. 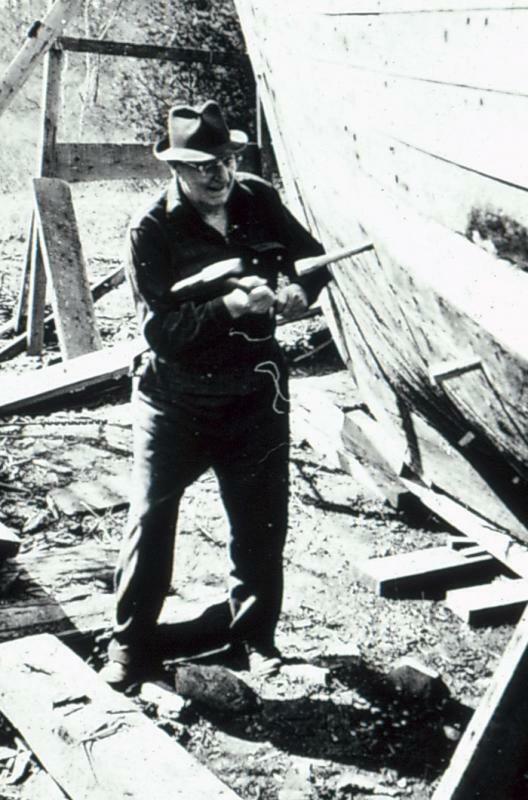 This image is from Basil Greenhill and Sam Manning, The Evolution of the Wooden Ship, 1988, p. 135. Used by permission of the artist, Sam Manning. 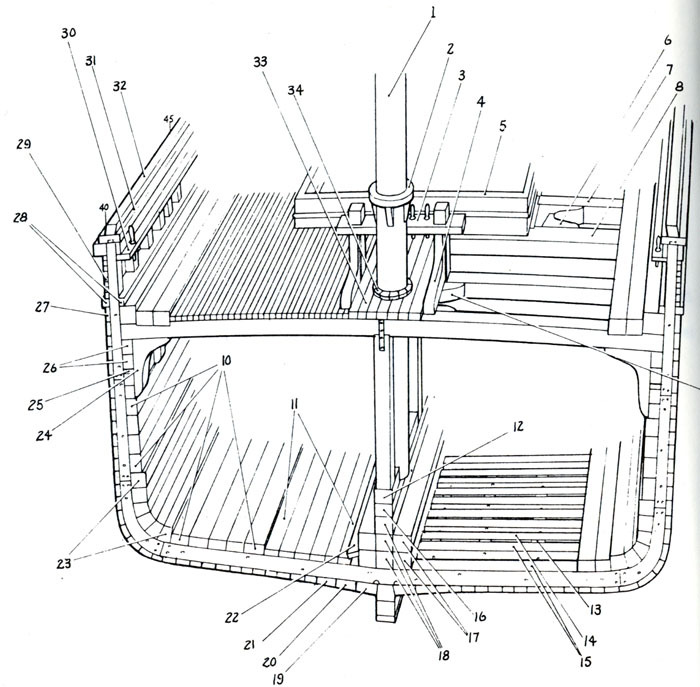 Cross-section of the four-masted schooner Bertha L. Downs, at the main mast, looking forward. This view shows the keel, keelson, frames, planking, ceiling, hanging knees, deck beams, and decking. Image drawn by Sam Manning for the book The Schooner Bertha L. Downs, written by Basil Greenhill, 1995, p. 68. 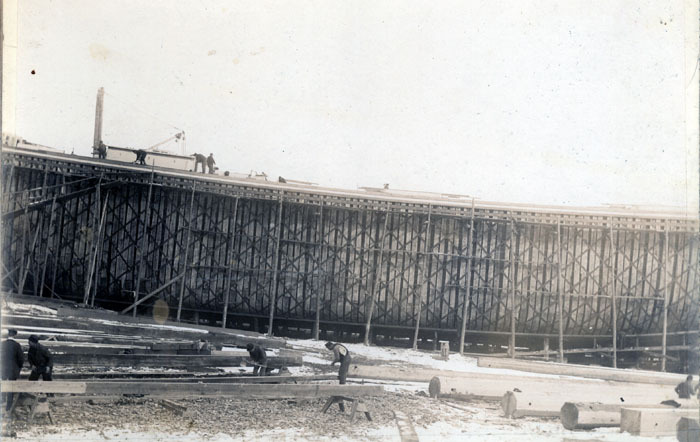 This cross-section of the four-masted schooner gives a good idea of the great amount of lumber used to build a ship. Note that many of the timbers are 12" X 12" in section, and that most of the planking is 4" thick and ceiling lumber is 4" to 10" thick! Note how the hanging knee and stanchion provide structural support for the deck beam. Image drawn by Sam Manning for the book The Schooner Bertha L. Downs, written by Basil Greenhill, 1995, p. 71.